Marlie de Swart of Black Mountain Weavers always shows interesting and creative designs at our Skein Lane Retreat One of those this past retreat was the simple but elegant ribbed shrug…the design simple…the results elegant. Susanne was inspired by the garment and here is her verson. 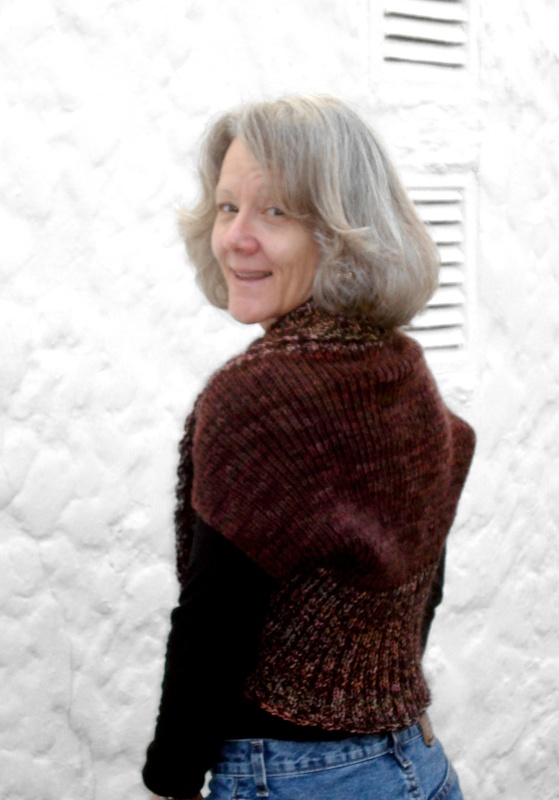 Marlie shared her pattern….Susanne used two yarns – Black Mountain double strand mohair and acrylic for the 2×2 rib, and Art Fibers Pachino 85% extrafine mernino and 15% nylon for the 1×1 rib. These yarns are light worsted weight yarns. 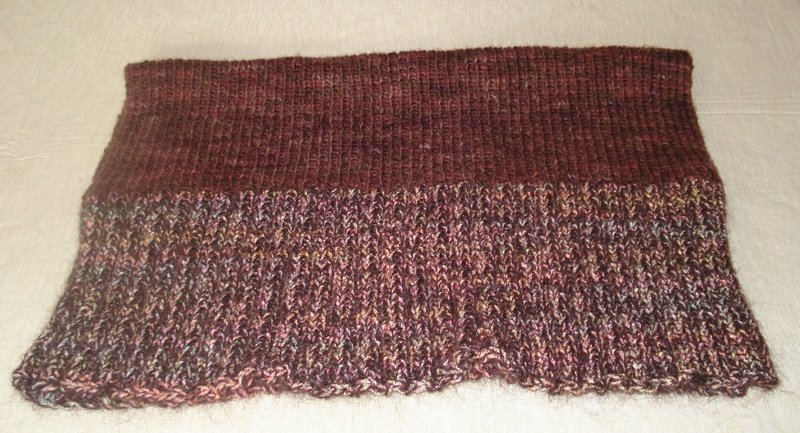 Gauge….be sure to swatch (30 stitches) with your yarn choice in 1 x 1 rib pattern. Then the goal is to take the desired bust measurement, divide by 2 to get back measurement. 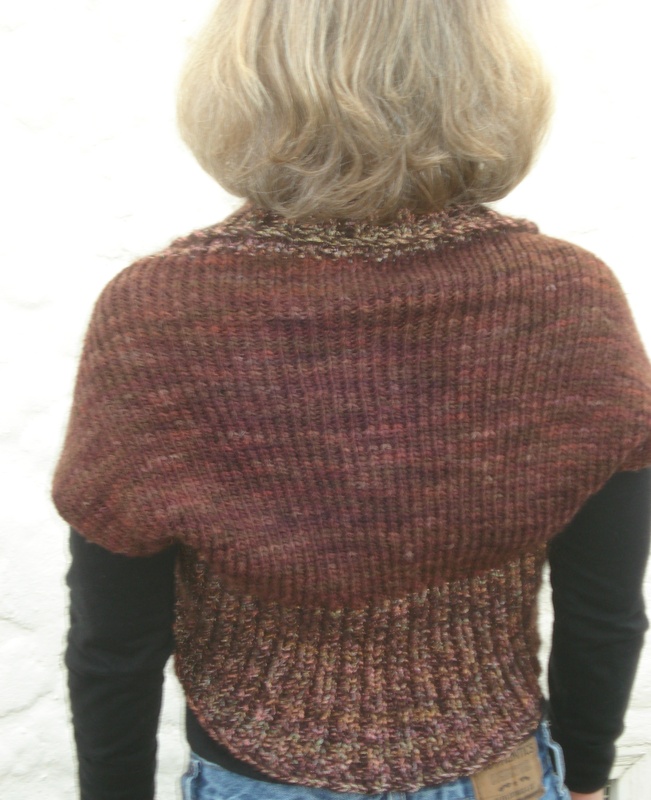 You will be knitting a rectangle and folding it over to join seams and create armholes, thus the rectangle is the width of the back of the shrug. Determine your gauge – divide 30 sts by inches measured in your swatch. Multipy that number by desired width of back. Then cast on those stitches and follow the directions below. In Susanne’s case she cast on 126 stitches. You can use one color throughout or follow Susanne’s creation of two colors – one color for the 2×2 rib and the other color for the 1×1 rib. With size 7 needle, CO 126 sts. Work 2 x 2 rib for 7″. With 2nd color, work 1 x 1 rib for 12″. With 1st color, work 2 x 2 rib for 7″. Fold over and sew the 2 x 2 rib sections together. You now have a shrug. I can’t wait to start mine…which yarn should I use? My choices are endless here at the Studio!